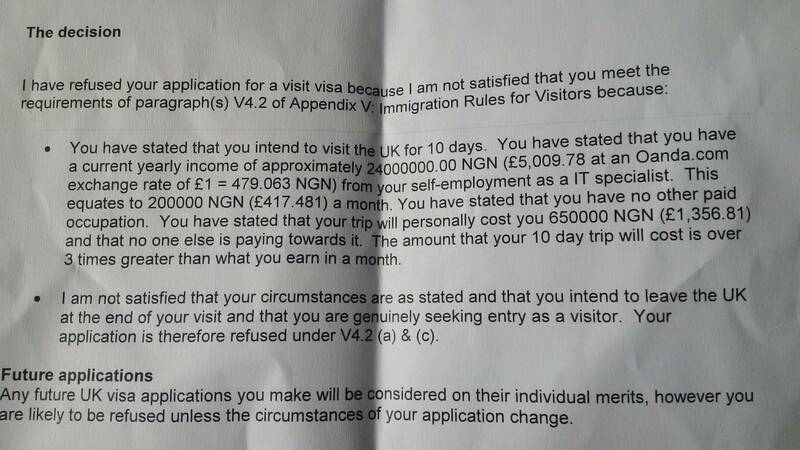 The UKVI ECO made a mistake while converting my salary to GBP and ended up using the wrong conversion to judge my visa application and I was denied base on that error caused by the ECO who handled my visa. Please, how do I resolve this as I was not given an option of appeal or administrative review? The conversion of 24,000,000.00 NGN per year base on £1=479.063 is £50,097.78 but ECO erroneously omitted 7 as quoted it £5,009.78 then he went ahead to use the mistake to calculate monthly income and gave the quote as 200,000 NGN (£417.481) instead of 2,000,000.00 (£4,174.81) per month. The maths are incorrect and, as other users are suggesting, should your application be watertight in all other regards, you could pursue two options. Fax/email the visa application centre that handled your application. You will not be able to connect directly with the visa section that made the decision, as they are protected (and prohibited) from contact with the public (against corruption). For Nigeria, that would be TLSContact. You would have to select the correct location (Abuja, Lagos-Victoria Island, Lagos-Ikeja) for the electronic contact form. Make your representation, succinctly: the maths noted in the refusal are not accurate, full stop. Avoid accusations, defensiveness, hot words. You can email the Independent Chief Inspector of Borders and Immigration. You can also email the consular section of British High Commission Accra. See the contacts at the bottom of each page. However before doing so - or before submitting another application, which is also an option - you need to make sure that your submitted application is airtight. Besides what Giorgio suggested in comments (bank statements and client contracts) I would also suggest adding more evidence stating what exactly you do, and why your pay is so good. I am unfamiliar with job market in Ghana, but according to this post a much smaller salary is already considered very high for Accra. ECOs are familiar with local salaries, and since your income is significantly higher, it is better to provide further evidence confirming your credentials and salary. Don't treat it lightly - 50K GBP a year is quite impressive income even for UK. You might provide your resume, reference letters from clients, and so on. Also here I assume you've been working on this job for quite some time. If you started it, you should probably wait 6+ months at least to prove this is not just one time windfall. Finally, the evidence of your lifestyle matching your income could also serve an additional evidence. Owning a property in an affluent neighborhood and a decent car shows that you indeed receive this kind of income, and can afford your visit. Not the answer you're looking for? Browse other questions tagged visa-refusals standard-visitor-visas nigerian-citizens or ask your own question.